Initially put on the map for its tin mining industry, today the Thai island of Phuket is better known for its sandy beaches, swaying palms and colourful nightlife. 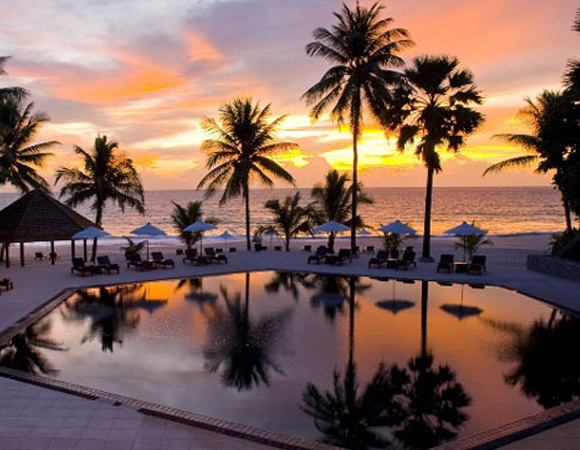 Once affected by the devastating tsunami, today 42 new hotels are being built as we speak, so it takes a very savvy tourist to know where to find a peaceful beach break… cue The Surin. The owners of The Surin have somehow managed to keep Pansea Beach off the tourist maps, so despite it being a public beach, it is blissfully empty, with the only non-hotel access possible via boat! This blissful location makes The Surin perfect for those seeking rest and relaxation. With 105 cottages hidden within a steep coconut plantation, the pristine resort offers undisturbed views of the Andaman Sea. The perfectly located hotel has even had a chic redesign, courtesy of acclaimed architect Ed Tuttle. The main focus point is the chic black-tiled swimming pool, which springs to life at sunset, reflecting the night sky. My beachfront cottage was one of those flooded in the devastating tsunami. During my stay the immaculate property was light and modern and its generous outdoor lounge area was idea for a sundowner. Although initially unimpressed by the Mediterranean bar nibbles, we were quite at ease in the hotel’s main restaurant, where we enjoyed authentic Thai cuisine, overlooking the glistening ocean. For a pre-dinner cocktail try their house special, which features a hint of fresh chilli to awaken those taste buds. During the hot days we loved the attentive beach waiters who brought fresh, chilled coconuts straight to our sun beds. Despite this hotel’s designer credentials, its affordable price tag means it attracts everyone; from young families to honeymooners. The only ones missing were the older generation – lucky considering its unusually steep design makes just popping to breakfast a full body work-out! The hotel offers a range of water sports; you can explore the bay by kayak or venture further afield aboard their Hobbie Cat. Adrenaline junkies can hire jet skis to spy on the resident super yachts (on our visit a Russian billionaire dropped anchor in his £120m floating palace). Those keen to explore the neighbouring islands will find local boat trips heading out to Ko Phi Phi and the stunning Phang Nga Bay marine national park. Culture vultures should journey to the infamous Big Buddha. Located high in the Nakkerd Hills between Chalong and Kata, the grand statue marks a viewpoint which offers panoramic views of the island, famous for its sunsets. You only have to venture to the neighbouring beaches to realise how special The Surin’s location is. While fellow tourists were fighting for spare sand in Patong, we reclined on our lounger on our own section of sandy beach, with undisturbed views of the Andaman and just the sound of the waves for a soundtrack. Set on a steep coconut plantation this is no place for the elderly or unfit with hundreds of stairs connecting the cottages to the resort facilities. www.thesurinphuket.com or call 66 76 621 590.
in-flight entertainment screens in all classes. Check www.thaiairways.co.uk or call 0844561 0911 for the latest deals.